Kick off your lucky streak with the Football Star online slot from industry game changer Microgaming. Filling a football-sized niche in the slots market, the renowned software developer has pulled it out of the bag with this soccer-themed game and delivered a scorcher. Not just one for the footy fans, Football Star packs plenty of bonus action – score some Free Spins and reap the rewards from the collapsing reels feature, which brings an extra element of fun to this high-action video slot. It's easy on the eye too, with colourful graphics and smartly themed symbols. Check out this guide before you showcase your skills on the pitch and you might just be named Man of the Match. This slot game is part of the highly entertaining Sports Star series, including Basketball Star, Cricket Star and Rugby Star. Packed with colour from the pitch to team shirts, with a stadium backdrop and animations that pop out from all angles, Football Star brings the excitement of the beautiful game to your device. 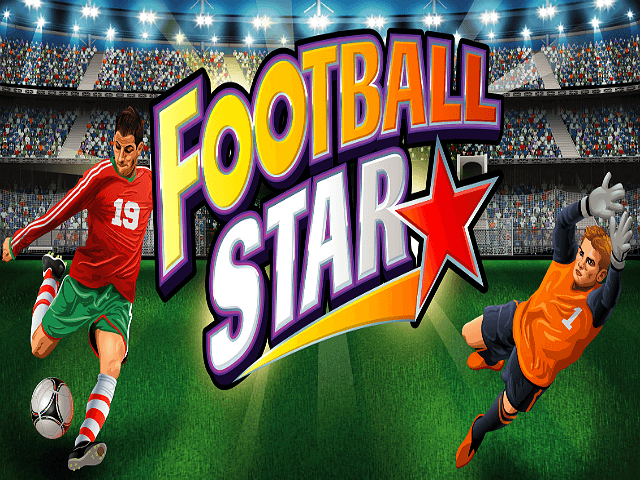 Football Star can be played from a reasonable 50p up to a high-rolling £50 per spin. You can select a coin size from £0.01, £0.02, £0.05, £0.10 and wager up to ten coins per line. The house edge on this 3D online slot is a mere 3.58%, so plenty of payouts are up for grabs. 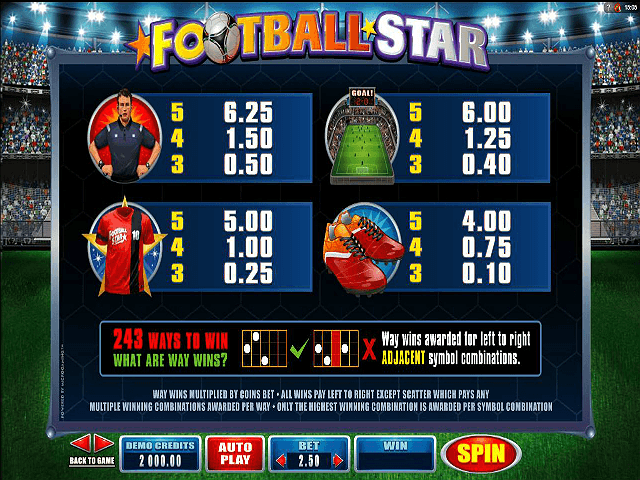 Football Star is played across five reels with 243 ways to win, which is Microgaming’s way of removing the standard paylines and replacing them with a more rewarding pay system for you. Its bonus features bring Wilds, Scatters, Multipliers and Free Spins to the reels, not to mention the Rolling Reels round itself, which kicks in after every winning combo. Football Star has a 5000-coin fixed jackpot to play for, so lace up those boots and put it past the slots keeper. The reels are populated with football shirts, referees, boots, stadiums, strikers and goalkeepers. These are the higher value symbols, while the ‘Football’ symbol is the Scatter and the ‘Football Star Logo’ symbol is Wild and stacked on reels two, three and four. 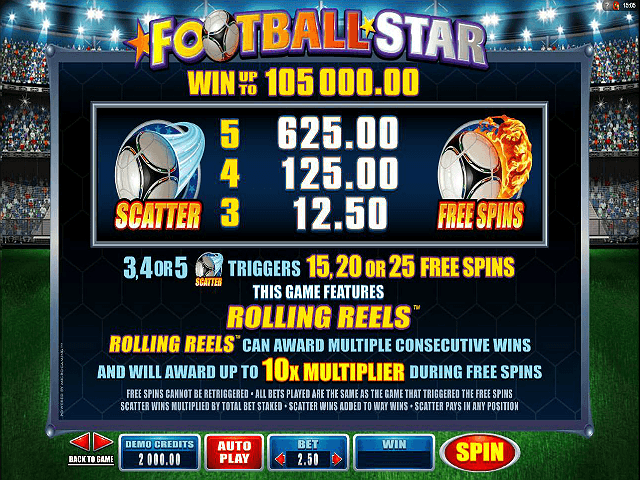 Football Stars has three bonus games, with the Rolling Reels round always active (except on a Wild reel). It comes into play in the base game when you hit a winning combo, replacing contributing symbols with new ones. This means you have a better chance of scoring a win from every single spin. The second feature is the randomly activated Striking Wild bonus, which turns either reel two, three or four into a Wild reel. It's triggered when you land three or more Scatter symbols anywhere on the reels. Once the action kicks off, the wins keep coming, with the three bonus games taking centre stage. 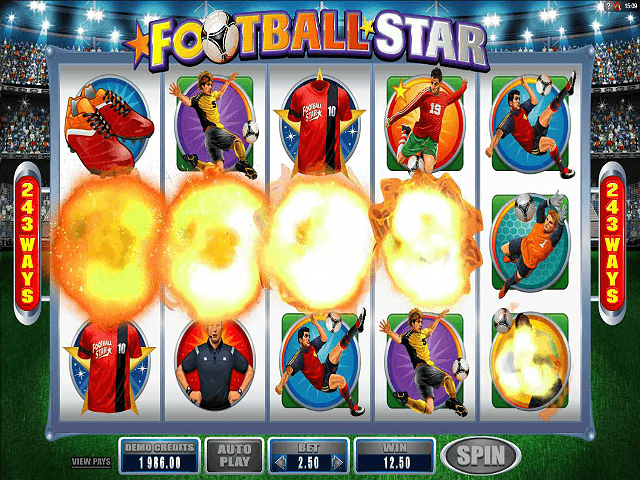 Football Star’s main attraction is the Free Spins game, which is activated through the Scatters. If you snag it, you’ll be awarded between 15 and 25 Free Spins (depending on the number of Scatter symbols you landed on the reels). During this bonus game, the Rolling Reels feature is active and Multipliers are applied to create more winning symbols. What a belter! The Multiplier starts off at 1x and with every Rolling Reel, the Multiplier increases to 2x, 3x, 4x, 5x and then 10x. This is where the wins are real bobby dazzlers, subject to a massive 10x Multiplier. Note, this rewarding extra can't be re-triggered. Ready to don your kit and play with pride? Check out Football Star today. 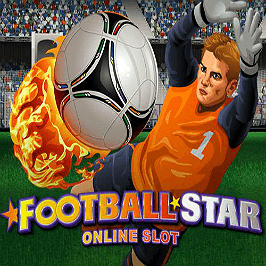 If you like Football Star - You'll like these slots too!